Shame on me for rushing Christmas but I can't help myself. i saw these holiday Junior Mints and had to get a box. I just love a little crunch. Why does a bit of crunch make things taste so much better? 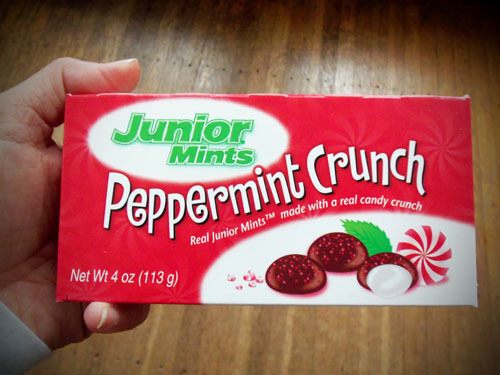 If all food was mini and had crunch I would be in big trouble. I got some Oreo Peppermint cookies this weekend that have a crunch! I haven't tried them yet but they are the first Christmas item I have brought into the house!